The BART Silicon Valley extension is the largest transportation investment the South Bay will make for decades. The project will connect the East Bay and the South Bay with a 16-mile, six-station extension of the BART system. Once completed, the system will connect with Caltrain and form the “ring around the Bay” that generations of civic and business leaders have aspired to build. 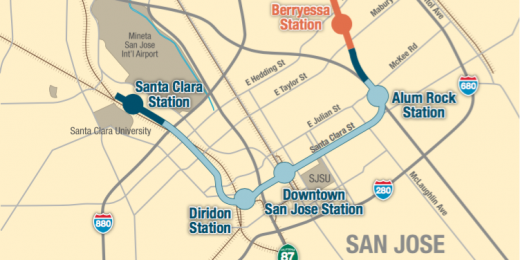 Phase I of the extension — which brings BART from Fremont through Milpitas to Berryessa in San Jose — is under construction and scheduled to start service in the fall of 2017, a year ahead of schedule and under budget. Phase II of the extension will bring four additional BART stations: Alum Rock, Downtown San Jose, Diridon Station and Santa Clara. Estimates put the cost of Phase I between at $2.3 billion and the cost of Phase II at $4.7 billion. The Santa Clara Valley Transportation Authority (VTA) and many other stakeholders are now focused on answering the question: Where will the money for Phase II come from? Funding for Phase I came from a number of sources. About half came from Measure A, the 30-year half-cent sales tax passed in 2000. The remainder came from federal New Starts funding and the state’s Traffic Congestion Relief Programs. Federal funding was contingent on securing funds for operations, maintenance and capital reserve. Measure B, a 30-year one-eight cent sales tax passed in 2008, provided those resources. However, 2008 Measure B funds are not for the construction of the project. For Phase II, VTA’s goal is to secure about 29 percent of the total project cost from federal sources, 15 percent from state sources and 56 percent from local funds. For the local funds, Phase II will also rely on the 2000 sales tax. At one time, it was thought that Measure A would pay for the entire extension. But the sales tax has brought in less revenue than projected due to the dot-com bust, the 2008 recession and an over-estimation of revenue projections. As a result, there is only enough funding expected from Measure A to pay for part of Phase II. This has led to a $2.43 billion gap to fund Phase II. Only about half of the estimated funds needed for Phase II of the BART Silicon Valley extension have been secured. Chart courtesy VTA, October 2015​. How Will VTA Secure Another $2.43 Billion for Phase II? 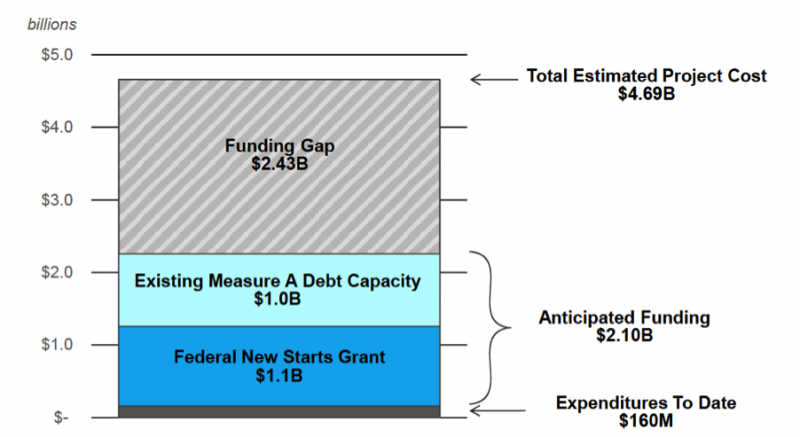 Federal and state grants are mostly one-time sources of revenue, primarily focused on capital investments rather than operations and maintenance. However, federal transportation funding is stagnating as needs across the country are growing. In addition, it has been several years since Congress created a stable, adequate funding stream, leaving many cities and counties around the country to come up with more creative funding streams for transportation. VTA is hopeful that it can secure over $1 billion from grant programs for Phase II. These could include California’s Cap and Trade Transit and Intercity Rail Capital Program ($750 million) and the Federal Transit Administration’s New Starts program ($1.1 billion). VTA’s ability to qualify for these grants is again contingent on demonstrating that it has secured local matching funds (i.e., through a future transportation sales tax measure). Long-term revenue sources will be needed for both ongoing operations and maintenance of the system, as well as to pay back debt and financing costs incurred to build Phase II. For long-term revenue sources, Santa Clara County is exploring a number of different options including a sales tax like the one under consideration for the November 2016 ballot, which leaders hope will bring in about $6 billion for the county’s growing transportation needs. VTA is hoping that about $1.5 billion of the sales tax revenue from this new measure would go to BART Phase II. There’s a lot left to be determined between now and next August when the details of the measure need to be finalized, such as whether VTA or the county could put the measure on the ballot and the mix of projects that would go before voters. Other long-term revenue sources could include a Mello-Roos community facilities district, an enhanced infrastructure financing district or fees such as a hotel tax or increased vehicle license fee. However, some of these take time because they’re more complex and often need to be implemented by, or in partnership with, local government. Unlike funding strategies such as grants or sales tax revenue, financing tools such as loans are expected to be repaid. Most major infrastructure projects require financing tools because they’re so expensive to build. For example, the extension of New York City’s 7th Avenue Subway was funded primarily through municipal tax increment financing bonds on new development at Hudson Yards. That means that bonds will be repaid by property tax revenues generated at Hudson Yards, a new master-planned, mixed-use real estate development with over 17 million square feet of space for office, retail and housing. Since the dissolution of state redevelopment agencies, California can no longer use tax increment financing, but other financing tools are available. Financing for BART Phase II could come from short- and long-term bonds, loans or other sources. But it costs money to borrow money. VTA has stated that it plans to employ financing tools very narrowly for uses such as bridging funding gaps during construction. The agency plans to actively manage cash flow in order to use only a limited amount of financing and, ideally, short-term debt to save interest costs. Today, Bay Area highways have heavy traffic and delays throughout the day, not just during rush hour. Many workers commute long distances to get to their jobs. At the same time, the preference for better transit service and walkable communities is growing. For the south bay to continue enjoying economic success and a high quality of life, BART Silicon Valley is an essential investment. Although VTA is leading the efforts to deliver BART Silicon Valley, securing funding and creating a successful transit project requires collaboration with cities, the county, regional, state and federal agencies, other transit operators as well as business and civic leaders. Local support for a sales tax is required in order to receive state and federal funding. Santa Clara has repeatedly taxed itself to support transportation investments; this gave BART Silicon Valley Phase I a leg up for state and federal funding. A similar commitment to a transportation sales tax in November 2016 will be needed to secure federal funding for Phase II. While polling found that voters are likely to support a transportation sales tax next fall, it is always challenging to secure the necessary two-thirds vote. Continued leadership from elected officials, advocacy groups advocacy groups and employers is critical to securing this local commitment. BART will be most successful if it is surrounded by transit-supportive land uses, which means maximizing density and good urban design. Ridership is linked to density. As we’ve described in prior research, it is important to put a lot of jobs near transit because people are more likely to take a train when their jobs are near transit. In other words, people will walk further from their home to a train than from their job to a train. Another reason to put jobs near transit is that access to urban amenities is attractive to employers. Some companies are already discovering that proximity to transportation and to other businesses are important factors for economic growth. Others are starting to prefer urban-style experiences — for example, Salesforce, which has chosen to forgo a corporate cafeteria, and Apigee, which factored proximity to transit service into its decision to move from Palo Alto to downtown San Jose. City land use decisions should be forward-thinking to make BART Silicon Valley successful. BART Silicon Valley will need excellent project design, station access and transit usability. There will always be reasons to control project costs by modifying the project design. But there are a lot of design decisions that we need to get right in order for BART to be usable. Will it be easy to board trains and to enter and exit stations? Will the stations have good connections to other modes of transportation? Will it be easy for people to find their way to their ultimate destinations? Will stations and waiting areas be safe, well-lit and well-used? The cities of San Jose and Santa Clara will each need to develop a vision for how they want BART stations to integrate with their communities, and then work with VTA to implement it successfully. The county will need an all-day, frequent regional transit network. Transportation investments in the county need to work synergistically to create a truly rapid, regional transportation system. This is particularly true for Diridon Station, where many different operators come together. This requires investments in frequent and efficient local and feeder transit service to effectively integrate with BART. Roads will need to work for all users, including autos, bikes, rapid buses and pedestrians. Mode shift programs and public-private partnerships, particularly with large employers and destinations, can also support more transit ridership. This requires the county, working through VTA’s Valley Transportation Plan and local funding priorities, to support a range of transportation solutions. In coming months, VTA will continue working on a funding strategy to deliver BART Phase II. The agency is also working on environmental clearance for the project. Opportunities for stakeholders and members of the public to comment on the draft document will begin in the summer of 2016. Even when funding is secured, many additional efforts — by elected officials, advocates, cities, the county and others — will be needed to plan and deliver a high-quality project that integrates successfully into neighborhoods, connects seamlessly with the existing transit network and attracts high ridership. VTA and the City of San Jose are launching several efforts to do just that in 2016, including a multi-modal station access planning effort. SPUR looks forward to participating in these efforts. Together we need to make sure that the end result of this significant investment is worth every dollar.